You must be true to the country in shouldering the national defence duty. The Tatmadaw born during the independence struggle battled to restore independence together with the people. 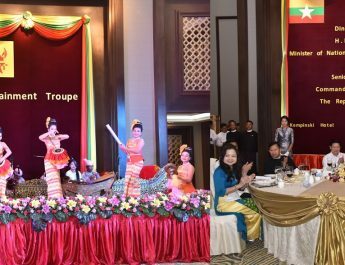 The Tatmadaw has placed in the fore Our Three Main National Causes in safeguarding the independence and for the perpetuation of sovereignty after Myanmar became an independent country. 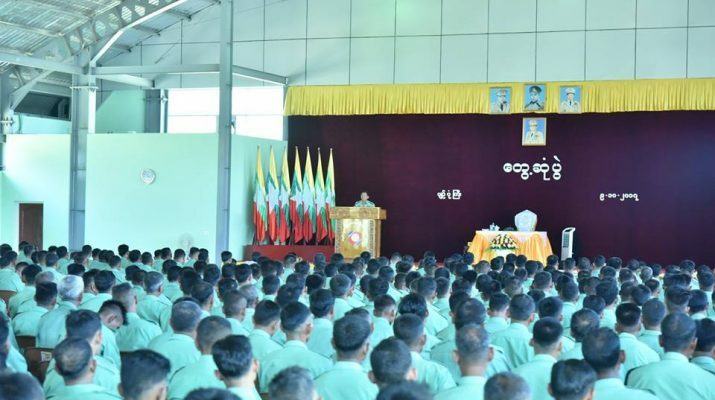 In shouldering this national duty all must be systematic and disciplined to win the trust and reliance of the people, said Commander-in-Chief of Defence Services Senior General Min Aung Hlaing at his meeting with officers and other ranks of Bago and Pyinbongyi stations this morning. The Senior General accompanied by Commander-in-Chief (Navy) Admiral Tin Aung San, Commander-in-Chief (Air) General Khin Aung Myint, senior military officers of the Office of the Commander-in-Chief (Army), the commander of Yangon Command, the commander of Southern Command and officials, visited the Reinforcement and Resettlement Unit of Pyinbongyi Station. At the officers mess, the Senior General and party heard a report on general staff, adjutant and quartermaster affairs, breeding of milk cows, DYL pigs, Novogen Brown layers, growing of star bean cashew and seasonal crops, greenhouse cultivation of muskmelon, soap production, candle production and feedstuff production presented by the commander of the station. The Senior General gave instructions on the prioritization of the artificial limb programme for unfit soldiers and substitution of old artificial legs with the new ones and transportation of soldiers to military hospitals for medical checkups by military truck. The Senior General said as for the livelihood of the families of the unfit soldiers to operategarment industries programme must be made to extend star bean and cashew tree cultivation and produce finished goods. 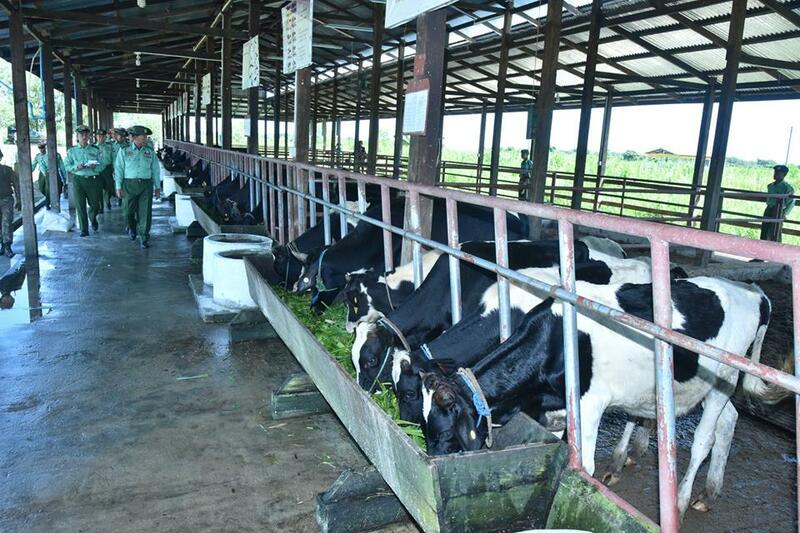 DYL pig, Novogen Brown layer and milk cow farming must also be extended to provide food for the people of Yangon. In accord with the market demand, soap, candle and feedstuff production must be extended. Agriculture and livestock are not for profit, but for the local consumption of soldiers and families and local people. So steps should be made to extend the farms from regional level to national level. 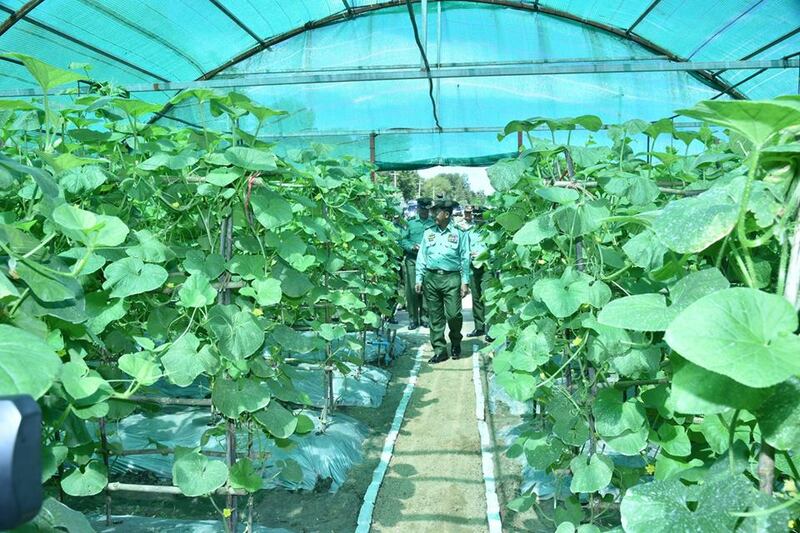 Afterwards, the Senior General and party inspected breeding of DYL pig, milk cow and Novogen Brown layers with cooling system, animal feedstuff plant, the growing of muskmelon with green house and the storage and packaging of seeds. Then, the Senior General and party met with officers and other ranks from Bago and Pyinbongyi stations at the gymnasium Pyinbongyi Station. In his speech, the Senior General said the Tatmadaw must have the ability to safeguard the country as it was the Tatmadaw’s main duty. All units needed to have prowess and power. Military prowess was essential. They must be equipped with three capabilities. Having better prowess was the duty of all battalions and units, including individual prowess. The Tatmadaw and the State were responsible for having better power including the armament of military equipment. All stakeholders were to cooperate to have prowess in order to safeguard the country. Regarding qualification, the Senior General said a service man must try to develop his skills. Basically, he had to perform their daily duties correctly for the improvement of their individual skills. He must wear the military uniform smartly and tidily. He himself needed to abide by the rules. In addition, officials needed to supervise him. Furthermore, he needed to adhere to the training policy: “Must be healthy and fit, be proficient, have courage”. He needed to enjoy a healthy life and do training for his fitness. In addition, he needed to undergo training for skill development and courage. On the other hand, the Tatmadaw was providing necessary administrative assistance for the livelihood of them. With respect to better public relations, Tatmadawmen needed to understand and perform their duties correctly. The performance of duty needed to be in accord with the codes of conduct. They would gain public confidence by following the 60-point military codes of conduct, rules, regulations and laws. 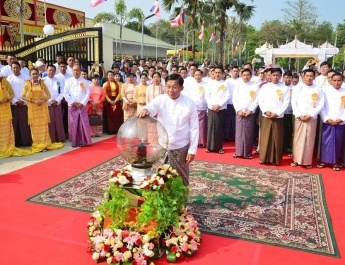 He called on Tatmadawmen to make all-out efforts to become a Tatmadaw on which the people rely, by serving the interests of people effectively. After the meeting, the Senior General presented books and journals on various subjects for officers and other ranks from the military stations through the deputy commander of No 77 Light Infantry Division. Then, the Commander-in-Chief (Navy) presented foodstuffs and the Commander-in-Chief (Air), sports equipment to officials of relevant military stations. Next, the Senior General and party cordially greeted officers and other ranks who attended the meeting. Afterwards, the Senior General and party arrived at the Tatmadaw Vocational Training School. At the parlour of the officer mess, the division commander reported on organizational setup of the military unit, capability and progress of conducting the training courses. 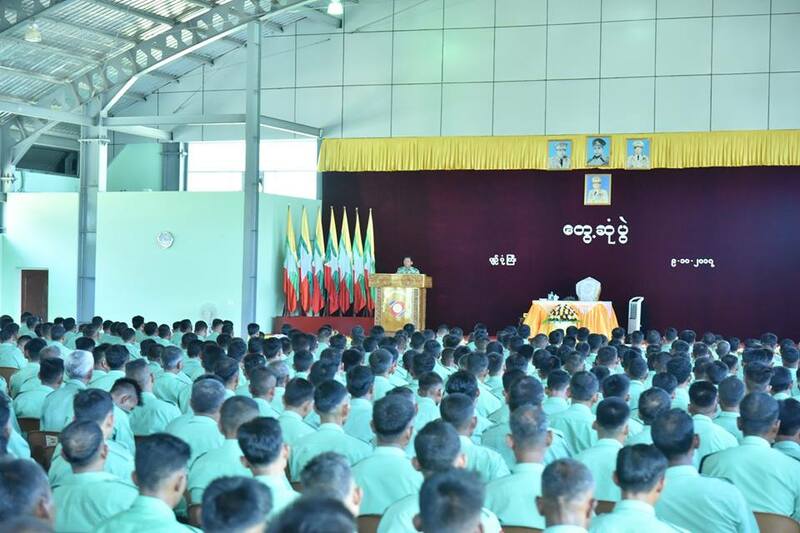 The Senior General instructed officials to train the military personnel to have high skills in respective vocational courses so as to apply it in the practical tasks as those training courses can contribute to livelihoods of those military personnel at a time when they take retirement from the Tatmadaw, to prioritize the trainees who are making preparations to take retirement from the Tatmadaw and to provide full of teaching aid for respective courses. Then, the Senior General and party viewed conducting of the hotel and motel security course, sericulture printing course, dyeing and printing course, glass painting, ceramic painting course, and hair dressing course. In meeting with the trainees, the Senior General urged them to learn the vocational subjects for having high skills in practical works and to emphasize learning the vocational subjects with excellent skills based on their keenness. 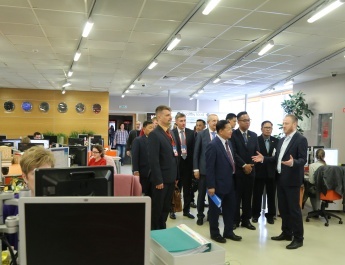 Next, the Senior General and party viewed round documentary photos and products of trainees displayed at the training hall. The Tatmadaw Vocational Training School is regularly conducting 19 vocational courses attended by not only Tatmadawmen but also members of Myanmar Police Force.